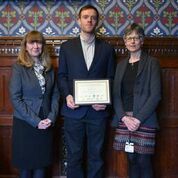 Joseph Butler (centre) receiving his award with Jacquie Mutter, CEO of OCN London (left) and Carmel Elwell, Access tutor at City Lit. Joseph Butler has won the prestigious Keith Fletcher Memorial Prize for Outstanding Academic Achievement on his Access to HE Diploma. Now at the London School of Economics studying International Relations, Joseph completed his Access to HE Diploma in Humanities and Social Science at the City Lit in London. MP Nick Dakin presented him with the Award at an event held at the House of Commons. The national Keith Fletcher Memorial Prize, organised by the Access Validating Agencies, is awarded in two categories; Outstanding Academic Achievement and Outstanding Commitment to Study on Access to HE Diplomas. Joseph was nominated by his Access tutor, Carmel Elwell, who praised his exceptional academic work throughout the course.